One of North Hollywood's leading bathroom and kitchen stores has announced the arrival of a new range of antique and modern bathroom vanities, which look set to offer their clients a more luxurious and versatile bathroom design experience than ever before. The new modern and traditional bathroom vanities are constructed from solid wood, which ensures that they will remain strong, durable and reliable for several decades in a newly refurbished bathroom. Available in a range of sizes between 24 inches and 72 inches wide, with single and double configurations as well as totally original designs, the range of cabinets is versatile enough that customers will be able to create a bathroom that totally encompasses their unique taste and style. Even the color and finish of the vanities provides a huge amount of choice. Among the impressive range of wood finishes is white, espresso, black, red, gray, natural wood and many more. 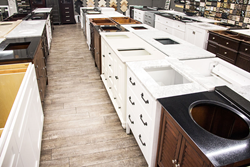 When it comes to counter tops, customers can choose from luxurious white marble, sophisticated black granite, and chic arctic white quartz, all of which can be customized for the perfect fit at Polaris' in-house stone processing facility. With so much versatility, customers can strive to create ultra modern bathroom vanities if that suits their design choices, or they can opt for classic and traditional bathroom vanities should they prefer. Speaking about the new range of vanities, a spokesperson from Polaris Home Design explained their decision to welcome in so many new styles. "200 is certainly a great deal of new designs, but we know our customers love choice, and that's exactly what we have to offer. Every single unit is the same incredible quality that our customers have come to expect from us, only now they have so many more options available to create a unique bathroom design that they can fall in love with." Polaris Home Design are true specialists in bathroom and kitchen design, having operated in residential and commercial refurbishments for over 15 years. For the last three, they have focused their efforts on retail and have been running an enormous kitchen and bathroom showroom right in the heart of North Hollywood. With the arrival of 200 new bathroom vanities, their showroom has without a doubt now become even more spectacular.